High fire load of organic and inorganic material mixtures. 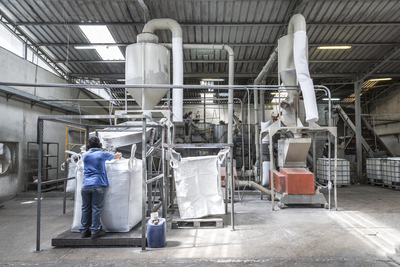 The process associated with granulating, sorting and processing - the recycling of raw materials - consists of various manual and automatic steps and is more complex than commonly accepted. This complexity is also reflected in the fire risks along the process chain. Right at the delivery of the recycling material and its storage it is worth counteracting potential sources of ignition. The quantities of organic and inorganic material mixtures hold a considerable fire risk due to the fermentation process. Taken together with batteries that are included and containers with flammable liquids that have not been completely emptied or spray cans, the ignition potential of recycling material increases enormously. Even the transport from one processing step to the next creates challenges to fire protection: For example the roller bearings of the conveyor belts may run hot and ignite. 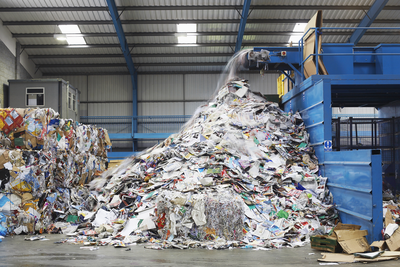 If the fire leaps on to the recycling material being transported, a fire can spread rapidly in other areas of the operation as well. Processing stations at which flammable liquids, for example in the form of hydraulic fluid, are used, represent an extra risk. On these machines an uncontrollable fire can easily develop and become an economic threat to the entire company. 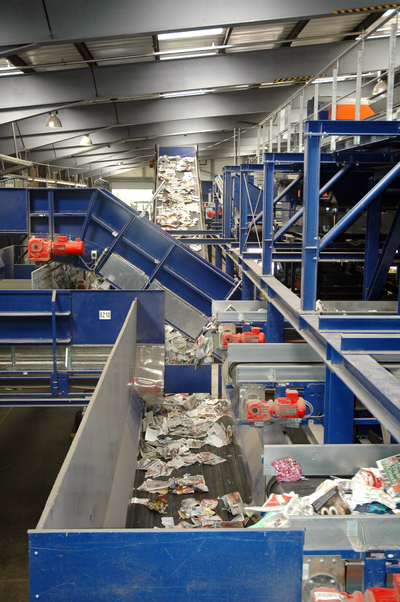 Sprinkler systems are an important component of building protection for recycling plants. 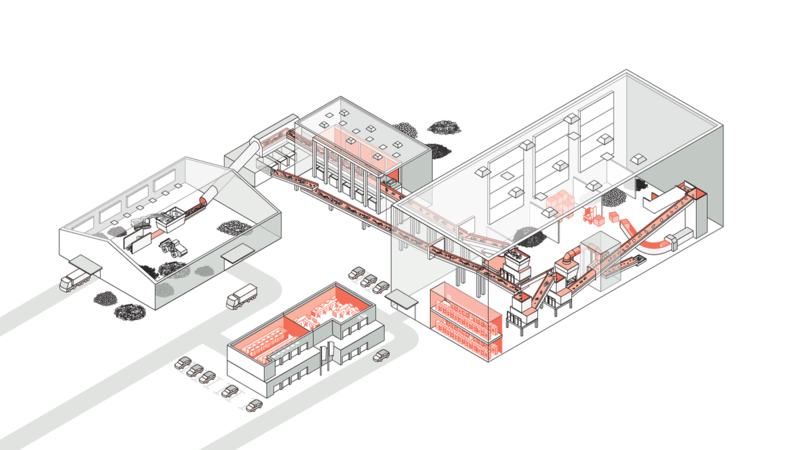 A fire detection system complements building protection in all areas. The fire detectors’ signals run together into the fire detection- and extinguishing control unit. This notifies people in danger as well as the fire service and in many cases assumes control and function monitoring of the fire protection systems. Hydrant systems complete the building protection and allow the fire to be immediately attacked manually. Depending on the operating process, raw-, auxiliary- and operating materials are stored in outdoor areas or delivered and often also stored in a shed. 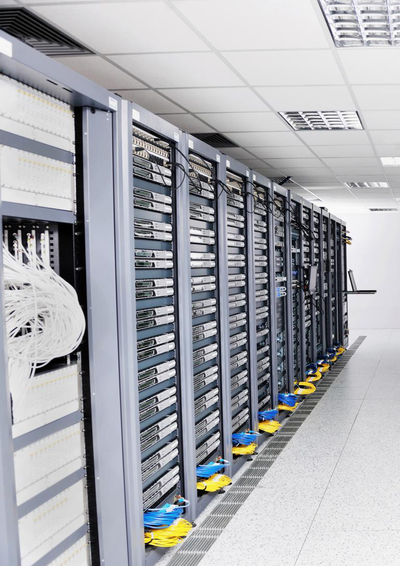 Frequently both storage options are found in a processing operation. Dumps situated outside are generally monitored with infra-red cameras for undesirable build-ups of heat. If there is a threat of ignition, a signal is transmitted to the connected fire detection control panel. Extinguishing monitors aimed manually or by remote control at the target provide for effective fighting of the so-called hot spot via water enhanced with film forming foam compound. Facilities nearby that are threatened by a fire are also selectively cooled with extinguishing monitors. 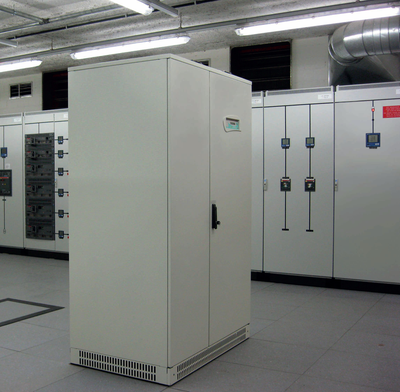 Internal storage areas on the other hand are securely protected against fire with sprinkler systems. Deluge systems provide for reliable fire fighting for ceiling heights above 15 meters. In this case automatic release of the extinguishing system is via a fire detection system. Smoke aspiration systems of the HELIOS AMX5000 type or UniVario flame detectors are used for detection. Offices, conference rooms and dining rooms are generally used by staff and guests. In addition, staff members may also retire to break rooms or smoking rooms and to kitchens during work. Corridors run through the entire building, serving as a main traffic route. Minifog EconAqua water mist extinguishing systems offer space- and water-saving protection and can be connected to an existing sprinkler system. In areas with higher ceilings, sprinkler systems provide reliable fire protection. 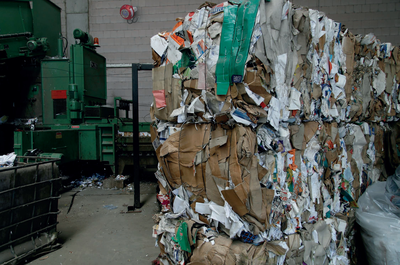 Recyclable materials are often divided, sorted and sometimes processed. 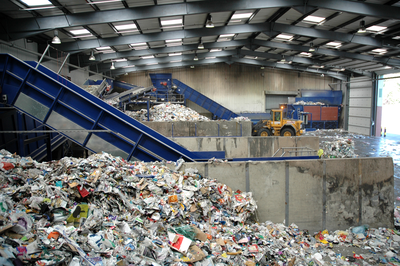 In order to obtain the so-called separated fractions, a large number of various steps are necessary in the recycling process. This includes different technologies and machines for operation such as vibrators, drum separators, magnets, shredders, mills, or air separators. Because fires quickly develop and spread, for this fire risk deluge systems with an admixture of film forming foam compound have above all proven themselves. The immediate and wide-area release and fire fighting over the defined area for protection provides for maximum safety. An alternative and more innovative solution is represented by Minifog ProCon water mist extinguishing systems. The crucial advantage of these systems is that in comparison with deluge systems they fight effectively with significantly less extinguishing water. A fire detection system releases the extinguishing system. The combined installation of UniVario flame detectors and multisensor gas emission detectors ensures early and nuisance-safe fire detection in these areas. During the entire production process, the raw materials, auxiliaries and consumables are transported to the next processing stations through enclosed or open conveyor belt systems. Deluge systems are ideal for protecting conveyor belts against fire, as the rapid spreading of fire requires immediate and large-scale activation or extinguishing across the entire protected area. Minifog ProCon water mist extinguishing systems are an efficient alternative for the direct protection of conveyor belt systems. A significant advantage is that this system uses considerably less extinguishing water compared to deluge systems. Detection of fires and triggering of the extinguishing system is via a fire detection system equipped with UniVario flame detectors and multisensor fire gas detectors. The areas where flammable materials are pneumatically extracted or transported presentan increased risk of fire. This particularly applies to the material mix in the extraction and conveyor systems. Function-monitored spark detectors respond reliably and immediately to the infrared radiation of passing ignition sources. They transmit a signal to the fire detection system, which consequently activates the solenoid valve of the automatic extinguishing systems within milliseconds. The extinguishing water is released through self-closing nozzles into the conveyor flow. The glowing particles fly into the water mist formed by the extinguishing nozzle and are thus extinguished. Immediately afterwards, the solenoid valve closes automatically. When fractions are being agglomerated using baling presses and briquetting plants, the materials that were previously separated from one another are concentrated together for further treatment. Conventional deluge systems with foaming agent admixture make a reliable solution for the hydraulic systems built into the processing machines. The “Minifog ProCon water mist extinguishing systems for hydraulic systems” protection scheme is an innovative alternative. The recognized design developed in collaboration with insurers and operators manages with considerably less extinguishing water than with conventional deluge systems. UniVario flame detectors guarantee rapid detection, and a fire detection system triggers the extinguishing system. 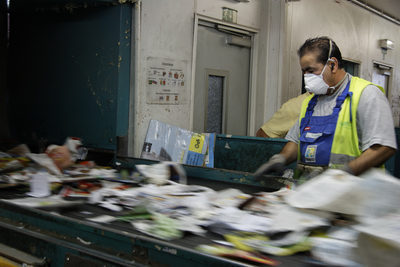 In sorting cabins, recyclable materials and subgroups are manually presorted. The cabins are encapsulated areas which are traversed by conveyor belts. 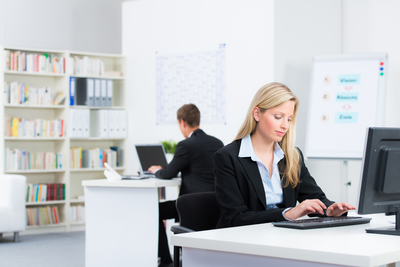 So-called manual workplaces are situated on both sides of the conveyor belts. In these areas, building protection in the form of a sprinkler systems ensures reliable fire protection. In order to ensure particularly early detection of fire, the fire detection system releases the extinguishing system.